Hello, I'm Paul Diggins and I'm a qualified Clinical Canine Massage Therapist and Dog Trainer. I'm married and live with my wife and dogs in Harpenden, and work throughout Hertfordshire, Bedfordshire and North London. The Clinical Canine Massage Therapy course takes 2 years to complete, and is focused on the treatment of soft tissue injuries and support for orthopedic conditions in dogs. It's highly specialized, and this deep attention to a specific area of canine health means that I can really focus on your dogs needs and effect a treatment. I first became interested in Massage Therapy when my boxer Izzy (the one at the back) had a problem that seemed to age her prematurely. She went from being a typically active and fun loving boxer dog, to an 'old lady' almost overnight. She is an agility dog, and she lost all of her drive and enjoyment in the sport. 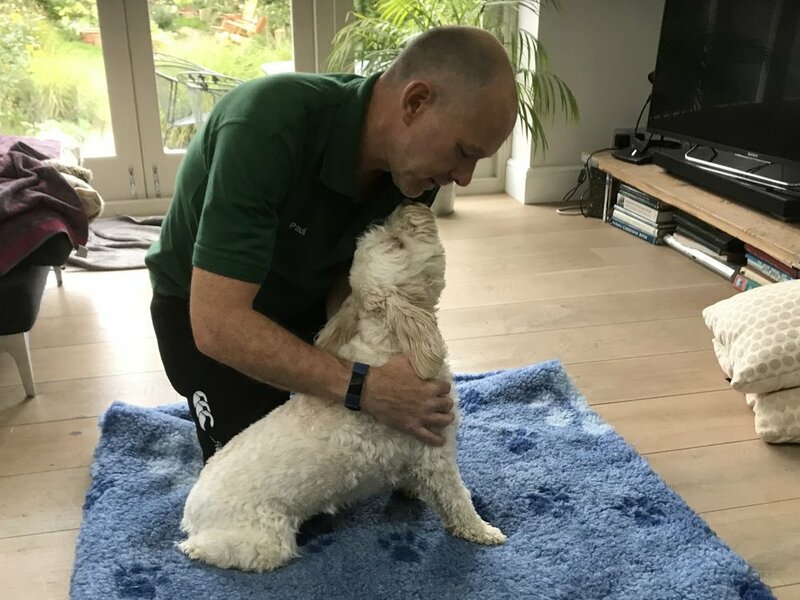 I saw first hand the benefits of Massage Therapy for my dog when she was treated for a lumbar strain, and I'm delighted to be able to offer your dog the same treatment. No one wants their dog to suffer pain or stiffness, massage therapy is an easy and effective treatment that is available to all. I look forward to meeting you and your dog soon. Does your dog suffer from lameness, arthritis or have a soft tissue injury, such as a sprain, trigger point or strain? Has he started to show signs of aging, or lost his zest for life? Has you dog presented with an orthopaedic condition, such as cruciate ligament damage, hip or elbow dysplasia or luxating patella? Winnie letting me know that I'm on the right track. Milly sitting still for a change! You will usually see results in between 1 and 3 sessions, depending on your dogs condition. The initial consultation is for 90 minutes, and includes fact finding, gait and postural analysis, and hands on therapy. Before we can treat your dog, we require a veterinary consent form to verify that massage is suitable for your dog, and to include your vet in the treatment plan. In most circumstances, your vet will complete this form free of charge. Following the initial consultation, you can book additional sessions, which are for 60 minutes. You should be aware that following massage therapy, your dog may display some short term symptoms, such as increased thirst or temporary lethargy, this is normal and is a result of the bodies reaction to the healing process. You may have heard this referred to as the 'Healing Crisis', and it is exactly the same reaction that we humans have to deep tissue massage. Where is the massage performed? In order to make your dog as relaxed as possible, we will conduct the therapy in your own home at no additional cost, bringing a massage bed for large dogs and a massage table for small. We have found that this gives the best results as the dog is in a familiar place. You are very welcome to stay with your dog throughout the consultation. It is essential to obtain veterinary consent prior to our first consultation. Your vet will be able to determine whether massage is appropriate for your dog's condition. This consists of the confirmation of the details submitted on the vet consent form, followed by a short Q+A about your dog, their food, daily routine etc. This should take roughly half an hour. The rest of the consultation consists of analysis of both the dog's gait and posture, followed by a muscle check (palpation) and the massage. This follows the same format as the second part of the initial consultation. Gait and postural analysis, followed by palpation and the massage. If you are unsure about how massage therapy can help your dog, please fill in the contact form below. Leave as much information as you can and I will contact you to discuss whether or not your dog's condition is treatable by massage therapy.